Doesn't really look like it, but this is the nightmarish ending to a dream I had last night. I woke up freezing in a thick terrible sweat with very tight dread in my chest. 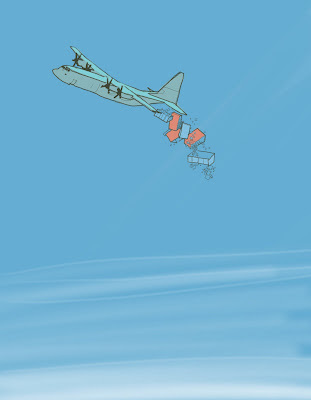 I think those're large containers full of individual soda cans slipping out the back of that plane. Posted by Greg at 8:41 p.m.
hahah nice greg! those colours are pleasing.